A Morning of Knittingy People. This morning my neighbour, my cousin and one of my friends (actually they are all my friends) all popped around randomly for a cup of tea. All four of us are knitted and I almost hyperventilated when I realised that we had formed an impromptu knitting group!!!!!!! It was like a dream come true so I think now we have to do some sort of official monthly thing about it. We even talked about knitting!!!!! The two photos below and one above are from my neighbour's bag. She is in the middle of crocheting a beautiful spring blossom blanket for an eight year old and a tie and cardigan for her husband. I think they are the luckiest people in the world. And the chunkiness of the cardigan wool... it makes me very tempted to do something similar for Jonno. I was working on a vest for Hugo to wear to school over his uniform. It infuriates me that their uniform is completely and utterly lacking any natural wool fibres. Another little boy in his class also has a hand knitted vest so I know he won't be alone. And when everyone left, I played around with my derwents, planning my next project. Paper cranes are such a good way to fill in a few minutes at the end of a studio morning. I haven't been spending much time up in the studio as all of my work seems to be much more couch based with crochet hooks and knitting needles. When all of the sunshine floods in though, it changes my focus as I don't want to waste any of that precious winter light. The boys revelled in the weekend weather, making bird houses to go with the milk bottle feeder that Archie made at Cubs. Archie decided he had better grind up the bird seed with the mortar and pestle as he thought the seeds might be to big for their little beaks. Awwwwww. I love my big boy. And to answer a question that keeps cropping up. The pattern for this hexagon blanket comes from Lucy at attic24. Her patterns really are the best. Time to cook dinner for the fam! Just a couple of non-sock bits; I was overjoyed to come home and find my first lot of bulbs beginning to flower. I finished knitting Jonno's socks in Australia. It was so satisfying to watch him put them on - they almost reach to his knees and successfully keep his toes very warm after a shower. Archie's second sock is still on the needles Hopefully over the weekend however, I will be able to take a photo of all the male feet in our household lined up clad in their new regalia. Now, please let me introduce you to a very special pair of socks. They were knitted for my step grandfather who was the chief officer on a naval ship and sailed to very, very, very cold places like the Baltic Sea - I think I need to ring Mum for a few more details... I will add more later. They are knitted with a very thick wool, either 10 or 12 ply and measure 81cm!!! I love the slight pattern that has been knitted in and would love to find the recipe for it. 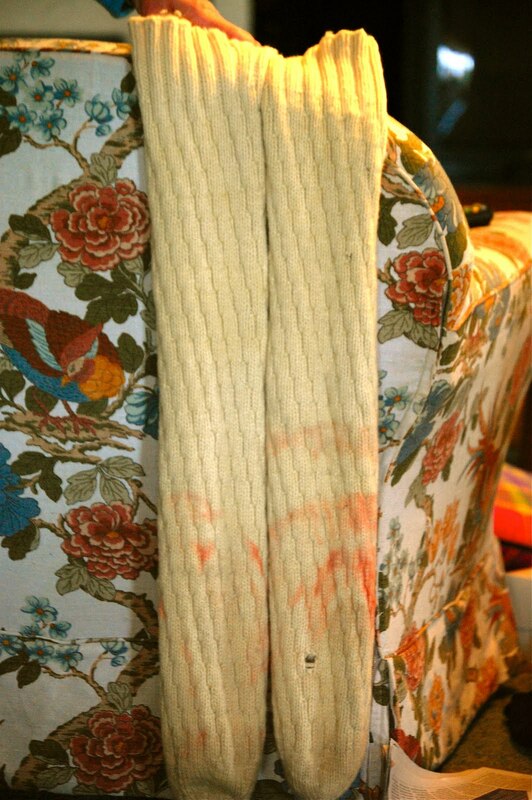 The ribbing almost resembles a slight cable and looks quite easy. And the final touch to stop your good socks from being mixed up with other sailors - a little name tag that has been stitched in with love. Nothing says it like socks. Well, I am home again!!! There was a nice window between gusts of ash (apparently Melbourne Airport is shutting down tomorrow) and I managed to jump aboard a plane and wing my way back to my boys (big and small). While it was so, so, so, so good to have a bit of extra time with my family, two weeks away from Jonno, Archie and Hugo was a little too much. The boys were very excited about the socks I knitted for them during my extended stay, but would you believe even more so about the lego I brought back for them... hmmm, youth of today. I included the top photos of the sun setting on my last night. I think the ash might have made the colours even more intense, it was all very pink, purple, orange and gold. The trees were a little damp and I am sure the raindrops on them were reflecting the colours as well. Beautiful. And so, today is a day of unpacking, washing and rehydrating (maybe a little bit of catnapping too). Hopefully then I can pull my crochet hook out and do something a little more fun towards the end of the day. This is my little nephew who I have flown over to Australia to meet. He is wearing a jumper I knitted from an amazing pattern - the details of which escape me at the moment but I will look them up when I go home. Anyhoo, I was only going to have one and a half weeks with my family, however... my stay has been extended as I have been left stranded by the ash cloud. While it is so lovely having extra time with the fam, I am desperately missing Jonno and the boys and really feel as though Archie and Hugo have now been without their mother for far too long (although I know Jonno has been doing an amazing job). I need to nuzzle and nibble them. In the meantime, I have been knitting lots of socks and crocheting slippers, one does have to keep themselves busy during adverse times... and it is so cold I have to do something in front of the roaring fire. Mum and I have been enjoying lots of chatting time, drinking tea time, knitting time and reading time which does soften the blow somewhat. This sock is being knitted by Sirdar's Crofter wool which is lovely and soft and makes the most fantastic pattern as you knit along. 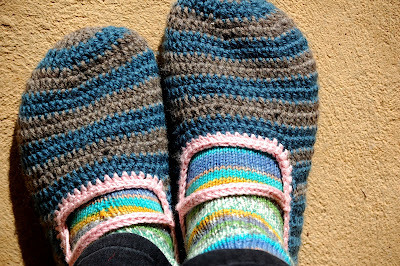 I am just using their sock pattern and it is a very quick knit. Here is a little craft project from my sister's house which she did with her daughter. I adore the colours and think it would be such a great class project to do towards Christmas time. Thank you so very much for all of your lovely and heartfelt comments over Willow's passing. I am so grateful for all of your words and they have really helped me. I almost felt guilty over my grief for Willow with all of the terrible things that happen in the world BUT, love is love isn't it and it is something we must treasure in every shape and form it it comes in - especially when it is given in that wonderful selfless way that dogs do. There are no photos today because I have ducked over for a quick trip to Australia to meet my new little nephew who is so divine I could eat him up and of course, to make the most of my 'been born for a long time nieces and nephews'. Right now I am on my mum's computer and haven't had the time to plug the camera in so there will be plenty of photos when I come back - lots of good knittingy and crochety ones too. This week we had the very sad task of saying goodbye to our family dog Willow. One morning she woke up feeling miserable and went down to the bottom of the garden to lie underneath our giant plane tree, nestled in a bed of Autumn leaves. Our vet arrived mid morning and discovered that her stomach was full of blood and thought it would most likely be bleeding from a tumour that would require urgent surgery. Hugo was at home for the day and we rushed her into his practice, aware that her chances of survival were very slim. It was monumentally heartbreaking leaving her on the table and saying goodbye. Even though she couldn't walk any more and the light was fading from her eyes, she used her last bit of energy to comfort me by lifting her head to look at me and wag her tail. Even thinking of it now makes my heart physically hurt. In the afternoon our vet rang to say that while they had removed a tumour the size of a small football, her spleen and liver were riddled with the cancer and there was no way to stop the bleeding. He recommended letting her go while she was still under anesthetic rather than allowing her to wake and die in pain soon after. I consented. Willow was in our life for almost ten years, almost the entire time I have been in New Zealand away from my family and for longer than we have even had our children for. She was the boys' nursemaid, allowing them to climb all over her and always, always keeping watch over them. She would never let them walk on the farm without her - even to the point of barrelling through fences to keep up. Jonno could ride off on the motorbike to work on the farm and Willow would let him go, however, if one of the boys were on the bike she would insist on coming. Willow was my dog. After I miscarried my first pregnancy at three months, I stood by the door howling. Willow was still a puppy and had a favourite toy that she loved more than anything. As I stood wreaked by grief, she came to me and placed her squeaky toy on my feet. Her mouth was so gentle (and she was a big dog), I would peel a banana and hold it for her and she would take little dainty bites, one at a time until it was finished. She could carry an egg in her mouth without breaking it and the other day, I was holding a spoon with something on it and she thought it was for her. With the utmost care, she delicately supped from the spoon as though she routinely ate soup. We buried her down in the orchard the next morning and plan to plant an avocado tree on top. She was a terrible avocado thief and used to constantly escape into the surrounding orchards in order to feed her addiction. In fact, she used to sometimes bring back whole, unpunctured avocados and we would confiscate them and eat them ourselves... so I guess we weren't any better. She is survived by our border collie Bertie who we are all helping through this sad time with lots of love, pats and treats. p.s. If you are wondering, Willow was a labrador crossed with an airedale. We used to call her a Lairedale.